R&R were contacted by the publishers of a new US book ‘Share or Die’. Below is the Editor’s Preface which is reproduced as a guest post with permission. About six months ago, a weather-beaten, middle-age man asked me for money on the platform of the Mountain View Caltrain station. I gave him three dollars. He thanked me, and asked what I did for work. I introduced myself, learned his name (Jeff) and we shook hands. I pulled out a card from my computer bag, and handed it to him as I told him that I publish an online magazine about sharing. That got my attention and I asked him to explain. Jeff said that a year earlier, his girlfriend drank herself to death alone in a motel room. He said she wouldn’t have died had someone been with her. For him, isolation meant death. Jeff explained his perspective further, that he had no problem giving his last dollar or cigarette to a friend, that it comes back when you need it. But there are those that just take. You stay away from them. That conversation got under my skin. I shared it with Malcolm Harris the next day on a call about this book. Half-joking, I suggested Jeff’s phrase, “share or die,” as a title. At the time, I thought it was over-the-top. I wasn’t serious. But, thankfully, Malcolm began using it in correspondence about the book. It stuck. My conversation with Jeff marked a turning point in my thinking. I had thought of sharing as merely smart because it creates positive social, environmental, and economic change through one strategy. But Jeff’s story and the directness of his phrase – share or die – broke through my intellectualization of sharing. Jeff helped me see something that I was blind to, even though I knew all the facts – that sharing is not just a smart strategy, it’s necessary for our survival as a species. This has always been so, but today our condition is especially acute – we’re using 50 percent more natural resources per year than the earth can replace. And global population and per capita consumption are growing. It’s now glaringly obvious to me that we need to learn to share on a global scale fast, or die. But the threat is not only one of biological death. Those like me, who are in no danger of starving, face a spiritual death when we act as if well-being is a private affair and gate ourselves off from the rest of humanity with money and property. We can neither survive nor live well unless we share. It’s my outrageous hope that the young voices in this book do for a generation what Jeff did for me – wakes them to the idea that sharing can save them and the world. Neal Gorenflo is the co-founder Shareable Magazine, a nonprofit online magazine about sharing. Why should you care about the new book, Share or Die? Sharing might just be the most important movement you’ve never heard of. On a planet with growing population and dwindling natural resources, it should be obvious to everyone that we need to share more. But it’s not. For this movement to succeed, young adults everywhere need a new vision for what’s possible for them in an new economy emerging today that values relationships over stuff and purpose over profit. 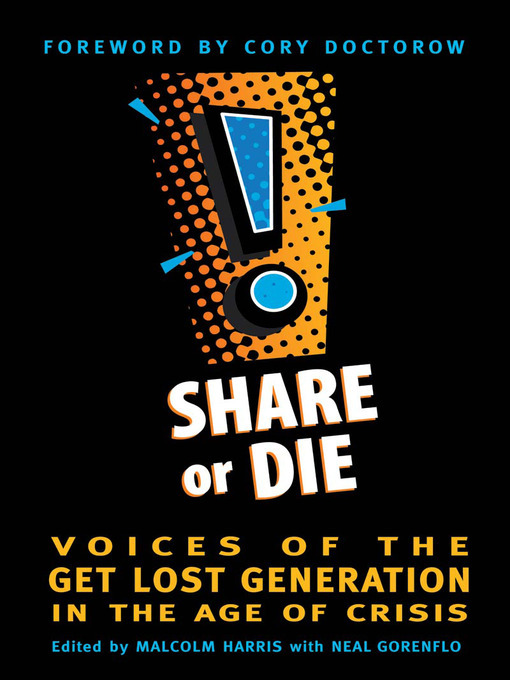 Share or Die was written by young adults for young adults to do exactly that. It contains 25 articles with hands-on, practical advice about career, relationships, travel, education, housing, and volunteering. Shareable is the online magazine that tells the story of sharing. We cover the people and projects bringing a shareable world to life. And share how-tos so you can make sharing real in your life. In a shareable world, things like car sharing, clothing swaps, childcare coops, potlucks, and cohousing make life more fun, green, and affordable. When we share, not only is a better life possible, but so is a better world. They show that a new world is emerging where the more you share the more respect you get, and where life works because everyone helps each other.